Enchanted Nails and Fluffy Dog Tails: A Tribute to JR Ewing and Dallas! For those who are new, or don’t really know me, yet, I LOVE the 80s tv show Dallas. I grew up watching JR scheme and ruin people and (literally) push Sue Ellen into a sanitarium. For years I could only remember parts of the last couple seasons (I was a kid), so last year I started collecting the dvd sets-I think I only need 3 more! When it was announced last summer that they were working on a "continuation" of the show, I squealed in joy. Since then I’ve followed every scrap of news I could get. The younger generation doesn’t thrill me (actor-wise) but knowing that JR, Sue Ellen, Bobby and co were returning to the screen just makes me grin like a fool. Ray, Lucy and Cliff will be back as well! I feel like I’m going to a reunion of old friends! What does this have to do with nail polish? Because it inspired me to do a very special mani, as a tribute to Dallas. I came up with 5 things that represent Texas, and free hand painted them on the left. There’s no way I could do them as well on the right, so instead…they got something else, as you see. 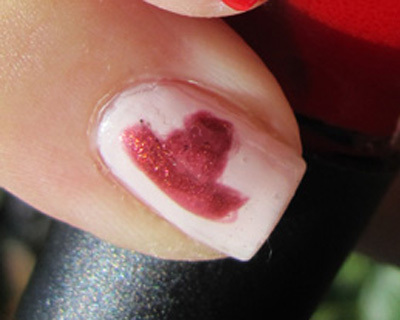 Please forgive my ugly cuticles, I touched them up in Photoshop so they wouldn’t be so scary! For this, I used Sinful Colors Easy Going (for the base) China Glaze Liquid Leather (the state and oil rig), Zoya Ivy (the ten gallon hat), Sinful Colors Pandora (the longhorns), and for the Texas state flag, Sinful Colors Ruby Ruby, and So Easy striping pens in white and blue. All topped with Seche Vite! For the right hand, I used Cina black nail art pen. I hope you've enjoyed my tribute to Dallas! I'm really proud of my freehand drawing, especially considering that I'm not very good at it, lol! I love your hand paintings! Ah, Dallas. Such fond memories of my childhood. :) Great nails!! thank you, ladies! 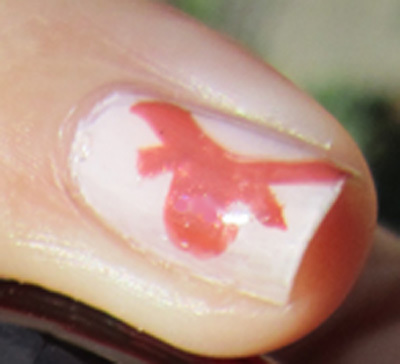 I'm hoping to work on more elaborate designs so I can enter some nail art contests eventually!